Easily rack out of barrels with inert gas instead of a pump! The gentlest and least aerative transfer method available! 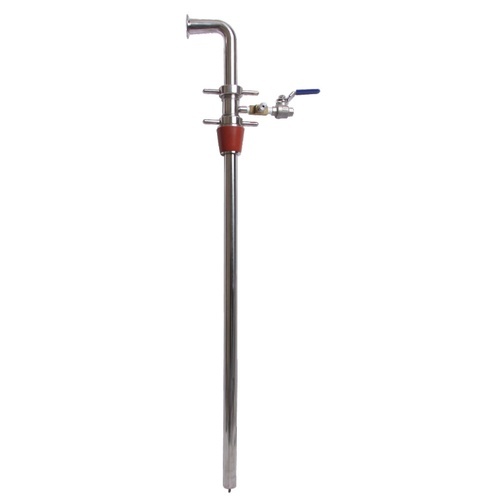 This handy Gas Transfer Wand allows you to temporarily convert your barrel into an ultra low pressure keg. Inert gas is passed through the locking collar into the top of the barrel, where the pressure forces the liquid in the barrel up and out of the racking wand. The flow can be slowed or stopped and any time by closing the gas inlet valve. And the barrel's contents are protected during the racking process because the empty space is being filled by inert gas rather than air. The locking collar/gas inlet can be adjusted to any position on the racking wand to accommodate a wide range of barrel sizes, and the adjustable lees pin on the bottom of the wand helps leave unwanted sediments behind.